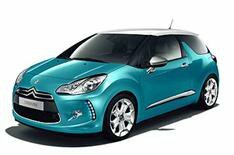 Come and see the Citroen DS3 | What Car? How would you like to be one of the first people in the country to see the car that's about to give the darling of the high street a real run for its money? The Citroen DS3 is ready to give style-conscious buyers of small hatchbacks a real alternative to the Mini, by offering a proper dash of je ne sais quoi mixed with a hint of real-world practicality. What Car? is offering six readers the chance to take part in a private preview of the DS3, a car which buyers will be able to personalise to their taste when it goes on sale next spring. The blacked-out front windscreen pillars, wrap-around side and rear windows, and distinctive 'shark fin' side pillars contribute to what Citroen calls a 'floating roof' look. As well as a wide range of body colours, the roof panel will be offered in a choice of black, white, blue or red. Door mirrors and running strips will also be available in a choice of colour or chrome finishes, while the wheels and wheel centres will also offer a range of colour choices. The interior will come in leather or a variety of coloured fabrics. There'll even be five gearknob finishes available. The preview will take place from 4-6pm on Friday, November 27 at our studios in west London. There will be representatives from Citroen on hand to guide you round the car and answer all of your questions. Snacks and refreshments will also be provided. • And a few lines on why you're interested in seeing the Citroen DS3. We'll be asking you for your views on the design, ergonomics and specification of the car your comments will be published in What Car? magazine, along with photos we'll take of you with the car. We'll be in touch by the close of play on Wednesday if your application has been successful.